“Are Target Date Funds a Ticking Time Bomb?” (FiduciaryNews.com, February 10, 2015) Like lemmings to the sea, retirement savers default to a controversial product. When the world goes into advocacy mode, it’s best just to turn off the volume. It’s not like anyone’s saying anything that will matter. “The good, bad of Obama’s retirement proposals,” (BenefitsPro, February 9, 2015) You might be tempted to look at this headline and think to yourself, “Hey, even a broken clock is right twice a day.” Truth be told, though, the author himself must tweak the “good” parts of the proposal. Who still has an ESOP option in their 401k plan? Color Tile, Global Crossing, Enron, and, now, Radio Shack. It’s a wall of shame. And speaking of shame, are the gloves finally coming off in the fiduciary debate? “RadioShack facing 401k suits,” (BenefitsPro, February 8, 2015) Could this finally be the final nail in the coffin of 401k plans offering company stock? How many times does this same scenario need to play out before plan fiduciaries understand the incredibly high level of risk this poses both to them and their employees. “Ex-SEC Chief: White House Memo on Broker-Dealers Shocking,” (On Wall Street, February 9, 2015) We had long thought Mary Shapiro had “left the building” but – voila! – here she is again. It’s unclear from this article if she’s shocked at the amount of money that’s being lost because there’s no uniform fiduciary standard or if she’s shocked that someone (presumably other than her beloved SEC) would propose a uniform fiduciary standard. Earth to Shapiro: Perhaps you wouldn’t have been shocked today if you did your job at the SEC when you had the chance. “FSI sets advocacy priorities for 2015,” (InvestmentNews, February 10, 2015) That’s their story and they’re sticking to it. “Wall Street Finally Blinks in Fiduciary Standoff,” (ThinkAdvisor, February 11, 2015) A brilliantly written synopsis of the famous White House memo and the industry’s guilt-ridden response. “Fighting the fiduciary rule,” (BenefitsPro, February 11, 2015) Homeland Security? Just what does that have to do with the Fiduciary Rule? “Aegon sued over alleged excessive fees in 401k,” (BenefitsPro, February 9, 2015) The claim is Aegon is charging 1.6% (in investment management fees alone) vs. the industry average of 30 basis points for similarly-sized accounts. It’s all due to what the claimant calls “layered fees.” This could have broad repercussions if the judge allows it to move forward. “Raymond James Backtracks on Clawbacks,” (WealthManagement, February 9, 2015) Not really. Clients will still get reimbursed. Only it’ll be coming out of the pocket of the firm rather than the advisors employed by the firm. The investing world has historically been at constant war. This style versus that style, Graham vs. Fisher, a little of everything vs. a disciplined commitment. It all makes for great marketing, but it has absolutely nothing to do with getting the job done. “Industry pressing the case for income solutions for DC plans,” (Employee Benefit News, February 9, 2015) And by “industry” the article is referring to insurance companies. This drip, drip, drip is necessary to convince retirement savers to do something their gut is telling them isn’t in their best interest. To be honest, every individual’s circumstance is unique. What’s in one person’s best interest may not be in the best interest of another. This is why arguing for or advocating “universal” solutions is a false pursuit. It makes one sound like – dare we say it – the government. “Maybe the Young Shouldn’t Dive Into Stocks,” (New York Times, February 9, 2015) Leave to the Old Grey Lady ignore the wisdom of “two wrongs don’t make a right.” Tactical asset allocation is market timing, pure and simple, so why encourage inexperienced investors to go down that road. Why encourage them to focus on anything other than saving? And that includes not taking money out of your 401k when you switch jobs. A 401k is not a bank savings account, and that’s the message they should consistently receive. “The Case for Actively Managed Funds,” (Wall Street Journal, February 9, 2015) This is big. A major publication is telling the truth about the fallibility of the “index funds are all you ever need” story. 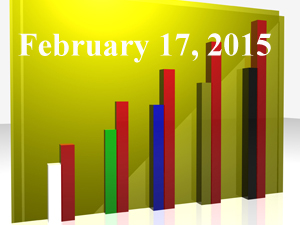 “Why risk dating?” (BenefitsPro, February 11, 2015) This is all about target date funds. Well, not really. It’s about what will eventually replace target date funds. The amazing truth: The foundation of these replacements have been around longer than target date funds. “10 things every investor should know about asset classes,” (MarketWatch, February 11, 2015) The author left our #11: Twice in the last 15 years we’ve seen when the market tanks big time, all asset classes are 100% correlated. “In target date funds, performance starts to trump risk management as assets balloon,” (InvestmentNews, February 12, 2015) More gasoline on the flames. Not only do different fund companies treat dates differently, but so do investors. Look for an explosion when the market drops as it regularly does. “Target Date Fund Inflows Not What They Used to Be: Morningstar,” (ThinkAdvisor, February 13, 2015) Well, no one expected this tree to grow to the sky. Look to some of the articles this week to help explain why target date funds aren’t growing as fast. “The paradox of choice: Can you have too many investment options?” (InvestmentNews, February 13, 2015) Hmm, haven’t we seen this before? The fact the story still needs to be told means people still aren’t getting it. Get it people. It’s important. “Why Active Managers Fail (and Why You Shouldn’t Fire Them),” (ThinkAdvisor, February 13, 2015) Here’s the bottom-line: Most managers don’t use a single index as a benchmark. Active management adds a valuable diversification that can help reduce the downside, something no index can ever do.